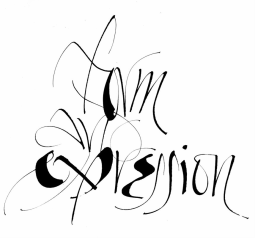 Back in the 1980s, a period when Thomas Ingmire was already beginning to establish himself as a calligrapher of note, much of his work drew upon poetry by William Blake, Arthur Rimbaud, T.S. Eliot, Wallace Stevens, Denise Levertov, Basho — exactly the kind of texts we typically associate with the strategies of modern calligraphy, which tend to adhere to a canon congenial to literary readers and so cooperate with the traditional, rule-bound duties of elegant lettering and decoration. 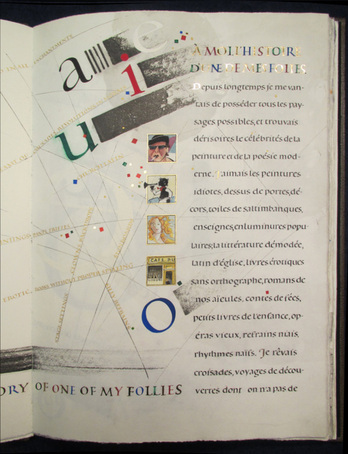 To look at that work now, after more than two decades, we can see that Ingmire was never interested only in the beautifully composed page, or in the well-trodden avenues of visualization and interpretation that preoccupy calligraphy at its most straightforward. Even then he was fascinated by the pictorial possibilities of language, the word(s) as image, the immersion of language in an exhilarating atmosphere of visual invention. Indeed, the very familiarity of those texts demanded that he invent, extravagantly at times, in order to challenge readers to consider them anew.